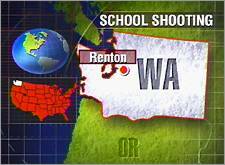 A 13-year-old student fired a gun from atop a lunch table inside the cafeteria of a Renton, Wash., middle school during summer classes Monday. No injuries were reported. The boy, described as blond with purple streaks in his hair and clad in black, fled and was still at large hours later. Authorities Monday evening were scaling back a search for the youngster after focusing their efforts on the woods behind the Dimmitt Middle School in this Seattle suburb. "There's only so much area we can search," Sheriff's spokesman John Urquhart said. "After that, you can't send people searching Seattle willy-nilly. We'll wait for a hard lead." Urquhart said the boy was still believed to be carrying a handgun. The gun apparently belonged to the boy's grandmother, KIRO-TV reported Monday evening. Urquhart said that after climbing up on a table and firing the single shot into the ceiling, the teen ordered other students to get onto the cafeteria stage, but they scattered and ran. Roughly 200 students were in the school at the time. Students said the boy frequently talked about wanting to kill a particular teacher. "He wanted to kill all the teachers, but he only wanted to kill a few students," said Cylas Sampson, 13. Sampson added that the gun-wielding boy told him not to worry about school anymore. "'Today's your last day of school,'" the boy reportedly told Sampson. Brittany Lamb, 14, was sitting at same table as the boy when he stood up and fired the shot. "He put the gun right up to my face and he said, `I'm going to kill you if you don't get up on the stage.' I was frozen. I could not move at all," Brittany said. A teacher shouted to the boy that police were coming and the boy swore and ran, Brittany said. Jonathan Carpenter, 10, said he was sitting in the cafeteria, playing with friends when he heard the gunshot. "I just ran. I thought I was going to die. I didn't know what was going on," the fifth-grader said. School spokesman Peter Daniels said authorities had received no previous warnings about the boy. "Generally, the kids have been really good about helping us to identify problems," he said.